Kovalam is the kind of place that Lonely Planet writers like to disparage as having sold out to commercial interests long ago, with their chock-a-block cafes and resto–bars and boutiques a la Cannes, while noting how Varkala up the road manages to maintain its wild and rustic more authentic nature. I beg to differ. For one thing: Kovalam ain’t that bad. For another thing: Varkala ain’t that good. These are basically your two beach options within an hour’s ride of the Keralan capital Trivandrum, aka Thiruvananthapuram (say that three times really fast and try to pull your tongue through the loop). Funny how you take everything in stride. Very interesting – and well written. I wouldn’t even be here if I hadn’t been dissatisfied with my previous digs in Varkala and Alleppey, so I figured if I’m going to make a move, then I might as well head up the road. Actually that was my conundrum from the beginning, knowing that Kerala in general is interesting and diverse, so where exactly then do I start and stop? 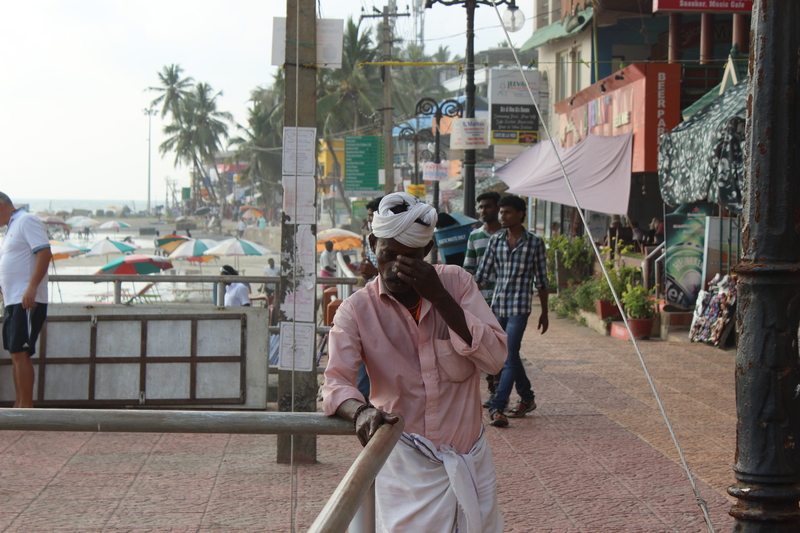 So I punted and caught the train to Trivandrum, figuring to find a nearby beach whereon to hang. I’ve been backtracking ever since, though still no more than a few hours from the big city. Kochi’s worth it, maybe not for the beach, though I don’t really know, but for the historic city itself, based around the old fort and port. This was an old stronghold for the Portuguese and an entrepot for many over the centuries, including ancient Christian sects and Jews expelled from the Roman burning of the temple at Jerusalem in 70 AD. The fact that it was so easily reachable from the early Roman world even adds fuel to the fire as to whether Jesus himself might not have wintered over here in his formative years, doing something similar to what the Beatles would do some two thousand years later. TBT: what a difference a year makes! Alleppey, aka Alapuzzha, doesn’t look like much at first glance, another decrepit little city in southern India, hot and humid, funky and fuming. 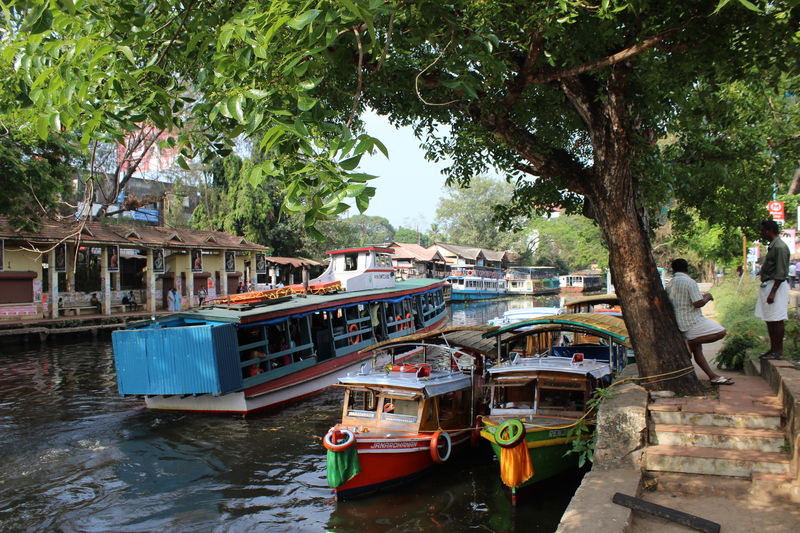 That viewpoint, however, ignores Alleppey’s position on the edge of a vast system of inland backwaters that connect much of the region—and also underlie the region’s tourist industry. Long ago the Portuguese and other Europeans decided that this all reminded them of something back home, thus producing Alleppey’s nickname of “Venice of the East.” There’s even a ferry to neighboring villages and towns. But houseboats are the big deal here. Unfortunately they don’t come so cheap, a one-day tour approaching $100. Ouch! That’s a bit too rich for my blood, just to float around the bayous for a day. They’ve got cheaper boats, also, fortunately, and they’ve got a beach, too. That’s more my speed, what with camel rides and bungee trampolining, everything you need. What’s a beach without a few camels? You know the answer to that already. I don’t know how their exhaust mechanisms compare exactly, but I’m pretty sure they’re cleaner than cows. The state of Kerala, way down south, is where those beach-combing backpackers-in-the-know go when Mumbai leaves them feeling cold and Goa leaves them feeling guilty. Here you’re back in the ‘real India’, at least, both good and bad. The good is that you’re actually in a foreign country, not just a tourist colony. The bad, depending on your tastes, is that alcohol once again is a precious commodity. That’s no problem for me, but it is for some people.